The United Grand Lodge of England issued the ‘Warrant of Constitution’ in the name of ‘The Rock Jubilee Lodge No: 4310’ on the 13th June 1921. This indicated that the first meeting would take place at The Masonic Hall, Oliver Street, Birkenhead. The Rock Jubilee Lodge was consecrated at the Masonic Hall,, on Saturday 5th November 1921, at 2.30pm by Lieut-Col. Hubert Cornwall Legh D.L., Right Worshipful Provincial Grand Master and WBro. Cuthbert Leicester-Warren J.P. P.G.D. Deputy Provincial Grand Master. WBro. George Legh J.P. P.A.G.Reg. Assistant Provincial Grand Master, WBro. Capt. W. O. Davies Prov. S.G.W., WBro. W.S. Garrett Prov. J.G.W., Assisted by Grand Provincial Grand Officers. The Consecration was followed by a banquet at 5.30pm. The charge for this banquet was 10/6d per ticket inclusive. Following the Consecration, the Installation of the Worshipful Master took place. 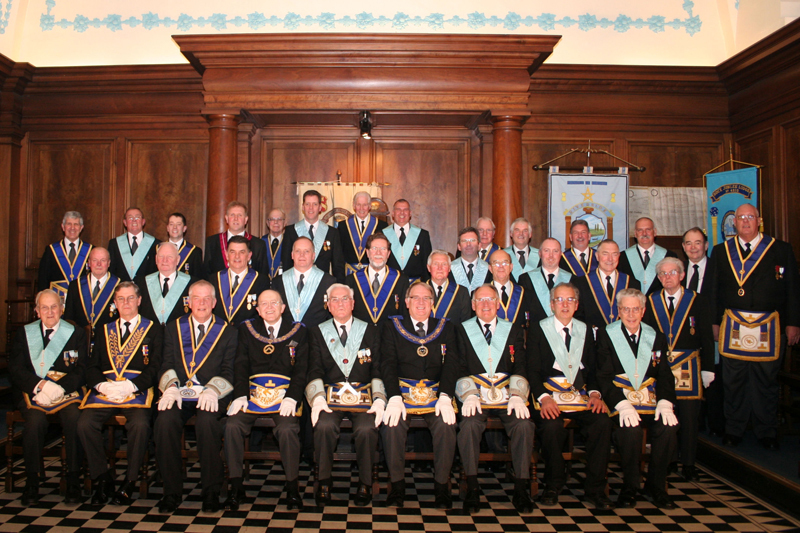 On that occasion the Office of Installing Master was carried out by:- WBro. Lieut Col. C.S. Dean P.G.D. The first Master of the Lodge was W. Bro. Wm. Henry Pincombe P.P.G.W. The Wardens were installed by W. Bro. Capt. W.O. Davies ProvSGW. WM WBro. W.S. Garrett ProvJGW. SW Bro. James Hannay McGaul J.P . The first S.W. never became W.M. because he died during his year a S.W. On four other occasions the SW failed to take office as WM. Following this Installation the first business of the Lodge was to elect a Treasurer and Tyler. plus the appointment and investment of Officers. Election of a Charity Representative and a Committee to frame the By-Laws of the Lodge. The Founders of ‘Rock Jubilee’ Lodge were chiefly members of ‘Rock’ Lodge. The first meeting was held on 2nd December 1921. At this meeting five joining members were accepted. They were:- Bro’s Wm. J. Moore; B. J. Cooper; Wm. P. Rhodes; H. A. Morrison and T. G. Blood. There were also two initiates at this meeting. These two initiates were ‘Lewis’ Members, their fathers being founders of the Lodge. They were initiated by the first Master. The Second Degree was performed by one of the fathers and the Third Degree by the other. They were presented with a Silver ‘Lewis’ Jewel on a collorette. They were J. Hector McDonald Inglis and Wm. A. Wallace. The Lodge has had a steady flow of candidates but has sternly set its face against having more than one candidate per meeting. However after the 1939/45 conflict double ceremonies were performed, presumably to accommodate returning servicemen. This continued for several years. When there were no candidates the Lodge had taken the Lectures as a serious part of its work. At that same time a Grand Lodge Certificate was rarely presented without a full explanation of its meaning. During that same period, three emergency meetings were requested and approved by the Provincial Grand Master, to Initiate, Pass and Raise Bro. Thomas Michael McCann, a serving member of the Merchant Navy, to coincide with his homecoming. The Lodge has always been small in membership over the years, less than 40. Small as the number are, there have been regular contribution to all the Cheshire and Royal Charities by Lodge and individual donations. Many brethren making their donations under the Covenant Scheme and many are highly qualified in all the Masonic Charities. In 1968 the Lodge contributed £1,000 to the Royal Masonic Institution for Boys Cheshire Festival and 100 guineas was donated to Gorsey Hey. At the 50th Anniversary Meeting a further cheque for £250 for Masonic Charities was placed in the hands of the R.W. Provincial Grand Master for allocation at his discretion. WBro. W. H. Pincombe PAGDC. WBro. J. G. Harriman PAGDC. Bro. Dyer occupied the position of Assistant Secretary, and for many years as Charity Representative for the Lodge, before moving to Essex. WBro. Inglis completed 50 years in Masonry in December 1971. The 50th Anniversary of the Lodge had taken place the previous month so his 50th celebration was somewhat quieter. To mark the 50 years, the brethren of the Lodge, presented W.Bro, Inglis with a radio, in appreciation of his devotion to Rock Jubilee Lodge. WBro. Inglis was further honoured by the Lodge and by Provincial Grand Lodge in 1981. Having completed 60 years in Masonry, WBro. Rev. Canon W. Stanley Walker P.Dep.G.Chap. Assistant Provincial Grand Master, paid tribute to W.Bro Inglis on his 60 years in Masonry and on being the first Initiate of Rock Jubilee Lodge. On this occasion a Silver Alms Plate was presented to the Worshipful Master by the A.P.G.M., suitably inscribed, to commemorate the 60 years in Masonry of WBro. Inglis and for use of the Lodge. WBro. Sydney Walters P.A.G.D.C. occupied the position of Director of Ceremonies for twenty years plus, attended L.O.I’s and Committee Meetings and was always available for any task asked of him. WBro. Syd celebrated his 50 years in Masonry in December 1986. WBro. G. R. Sherriff P.S.G.D. Assistant Provincial Grand Master paid tribute to WBro. Syd on his achievements in masonry and spoke of the tremendous impact he had radiated to the brethren of the various degrees of which he was a member. To honour WBro. Walters, the brethren of Rock Jubilee Lodge presented him with two Columns, suitably inscribed, to record his 50 years and these were placed in the care of the Wardens of the Lodge. November 1995 saw another ‘Lewis’ initiated into Rock Jubilee Lodge. WBro. M. J. Christian, the W.M. for that year, was granted special permission to ‘Ballot for and Initiate’ his son Stephen Philip Christian at the same meeting. The Lodge, at present, has a steady flow of candidates and the future of the Lodge is assured, however membership has remained small. January 1996 saw Rock Jubilee Lodge move venue from Oliver Street, Birkenhead, after 74 years, to Hulme Hall, Bolton Road, Port Sunlight. To celebrate the 75th Anniversary, which was celebrated on the 1st November 1996, one of the suggestions put forward and accepted by the brethren, was the purchase of a Banner to mark the occasion. This being completed, it was approved in open lodge and then by Grand Lodge. Also at this 75th Anniversary Meeting WBro. J. M. Powell celebrated 50 years in Masonry. WBro. Powell attended the Lodge Meetings regularly, but declined to progress toward the Master’s Chair for many years because of personal commitments. WBro. John then accepted appointments, progressed and was Installed in the Chair of the Lodge in January 1986 and has since occupied the position of Chaplain and later Lodge Almoner. At our 75th Anniversary Meeting a cheque for £1,000 for The Cheshire Provincial Fund of Benevolence, was placed in the hands of the VW.Bro. P. W. Wellings P.G.Swd.Br. Deputy Provincial Grand Master. 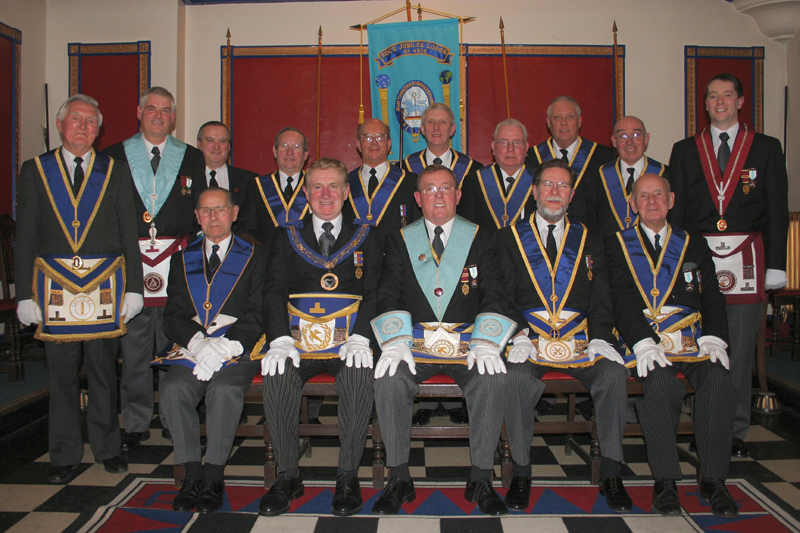 Over the years, Rock Jubilee Lodge has had a steady flow of Candidates into the fraternity. However in April 1996 Paul Dominic Noel Leon Fazackerley was initiated into the Lodge and became the last Candidate of the Lodge. WBro. Fazackerley progressed up through the offices to Worshipful Master in 2002. December 1996 saw the Lodge return to Oliver Street, Guild Hall, Birkenhead. The December 1998 ‘Regular Meeting’ saw the Celebration of 50 Years in Free Masonry of WBro. Henry Victor Helms, P.Pr.A.G.D.C. During that ceremony the Deputy Provincial Grand Master, WBro. K. P. Roberts promoted WBro. Helms to P.Pr.J.G.D. The April 2004 ‘Regular Meeting’ saw the Celebration of 50 Years in Free Masonry of WBro.George Fielding, P.Pr.G.Supt.Wks. During that ceremony the Deputy Provincial Grand Master, WBro. K. P. Roberts promoted WBro. Fielding to P.Pr.J.G.W. The March 2006 ‘Regular Meeting’ saw the Celebration of 50 Years in Free Masonry of WBro.Robert Edward Reardon, P.Pr.G.Swd.Br. During that ceremony the Deputy Provincial Grand Master, WBro. K. P. Roberts promoted WBro. Reardon to P.Pr.J.G.W. The January 2007 ‘Regular Meeting’ saw the Celebration of 60 Years in Free Masonry of WBro.John Major Powell, P.Pr.G.Swd.Br. During that ceremony the Deputy Provincial Grand Master, WBro. R. J. Ellershaw promoted WBro. Powell to P.Pr.J.G.W. Concern had been expressed for a number of years as to Lodge Membership. Dwindling numbers and an ageing member profile lead to discussions with other Lodges in a similar position. As the result of these discussions the remaining 18 members of Rock Jubilee Lodge were asked to consider the options and at the April 2007 ‘Regular Meeting’ a secret ballot took place. The proposal was that we Amalgamate with two other Lodges, Lilley Ellis Lodge No: 3236 and Riverside Lodge No: 4201 and that the resulting new lodge would take the Warrant Number of the oldest Lodge. The new Lodge would be called Phoenix Lodge No: 3236. The result of this secret postal ballot proved unanimously in favour. The final ‘Regular Meeting’ of Rock Jubilee Lodge will be Friday 7th December 2007. Unfortunately over the years the first Minute Book has been mislaid. Thanks therefore are expressed to WBro. C. R. Lockyear P.P.A.G.D.C. for his contribution when he prepared a brochure for the 50 years Celebration. Thanks also to all the Secretaries, for the manner in which they recorded the minutes, without which this task would have been impossible.